I'm going to be honest I don't like this album. I can enjoy it, but in order to do that you have to be in the right mindset. To start off let me give you some background on the Gorillaz. 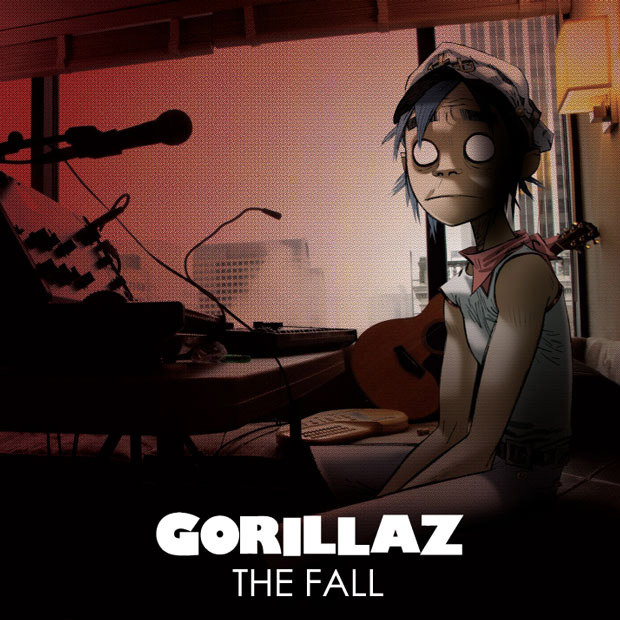 In 2001 Jamie Hewlett, one of the artists behind Tank Girl and Damon Albarn released the Gorillaz first Album. It was a pretty great one. I still listen to Clint Eastwood and 19-2000 a lot. Anyway it's a virtual band. One of the points behind it is to create that virtual band. It's a really cool, really intensive art project. I loved the Gorrillaz first two albums, Gorillaz, and Demon Days, but I didn't really like their third album, not counting remix albums, Plastic Beach. It was a little too trippy for me. The Fall is a lot more like Plastic Beach than any other album they've done before, but is also a pull back from it. Most days I wouldn't like it, but it has a good sort of repetitiveness to it. Ultimately the music speaks about monotony, the slow drudge of moving without real purpose. This is traveling music. There is a reason for that, but I don't want to get into it. Oh what the heck. The album was created completely on I-pad while Albarn was on tour. I respect that, using new tech to make a new sound, even if I don't particularly like that new sound. My problem is that this is music you have to get used to. It's like Yahiko said about Kaoru's cooking in Rurouni Kenshin. You aren't supposed to have to get used to it.